Pool Covers: What's the Difference Between 400 & 500 Micron? You are at:Home»Pool Covers & Rollers»Pool Covers: What’s the Difference Between 400 & 500 Micron? Pool Covers: What’s the Difference Between 400 & 500 Micron? Pool covers are a necessary accessory for any pool. Choosing the right thickness, either a 400 micron pool cover or a 500 micron pool cover, will affect both your budget and the cover’s lifespan. If you’re reading this article, you probably already know the benefits of buying a pool cover and are just about ready to buy. You already know that a solar pool blanket will keep most of the debris out of your pool and make your pool warmer too. So let’s get into it and find out which thickness cover you need. Pool covers come in a variety of sizes for use with most standard pool sizes, or can be cut to fit more exotic shapes. 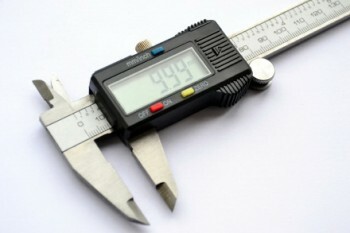 The thickness of the material is measured in microns. A metric measurement, one micron is equal to one thousandth of a millimeter. The higher the number, the thicker the cover is. e.g. a 600 micron cover is thicker than a 500 micron cover. While the variation between a 400 and a 500 micron blanket is slight, the difference can be significant. The most common thicknesses available in Australia for residential pools are 400 & 500 micron pool covers. These swimming pool covers are a good thickness. 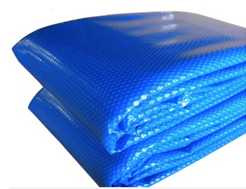 400 micron is normally the minimum thickness that is recommended for a quality pool cover. 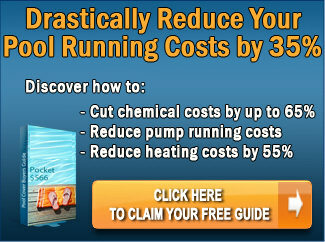 A thinner cover such as a 300 micron will not last long and will quickly be degraded by the sun and pool chemicals. Same goes for a 400 micron cover. It is a little thinner than the 500 micron cover and they consequently don’t last as long but they are still a good thickness. You’ll get most of the benefits of a 500 micron blanket including warmer pool water, reduced evaporation and money savings in pool chemicals. The warranty for a 400 micron cover will be less than a 500 micron cover. A 500 micron pool cover offers higher quality but they are about 25% more expensive. With a 25% increase in thickness, you gain an added layer of durability and slightly improved heat retention (although not much). The heavier material is less susceptible to tears or punctures (like from falling branches). It will better resist damage from the pool chemistry and from UV rays for a longer period of time. The typical 500 micron cover will carry a much long warranty too. Depending upon the amount of use you plan for your pool and the protection you need from debris, you should be able to make a choice that best suits the needs and requirements of your pool, while keeping within a family-friendly budget. We would love to hear about your experiences with Pool Covers: What’s the Difference Between 400 & 500 Micron? Please leave your comments below and share the article with anyone you think may be interested. The information about pool cover thickness is very useful but we need more info before we can proceed with ordering. We live on Gold Coast and receive a fair amount of sun, size our pool is 9 x 4 m. If the cover is properly installed and left on the water except when using the pool, what would be the average expected lifespan for 400 and 500 microns? Lifespan depends on many factors. 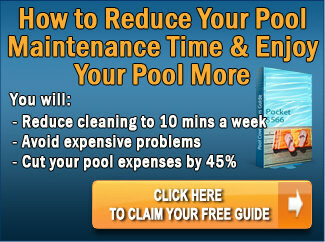 If the pool is well balanced – the wrong levels will cause faster deterioration. The amount of sun the pool cover gets also makes a difference. And the brand of the cover. Really cheap ones only last a year. Better quality ones can last 2-4 years and the highest quality covers last 5-9 years. In the in end you normally get what you pay for. You should also check the warranty period to make sure you’re covered – some warranties are pro-rata so after several years, the warranty is almost useless. Hope that helps a little. Bought a 400 micron cover online which didn’t even last a season- it started to flake the first days it was on the pool. what would have caused this? Will this (eventually) be repeated in any pool cover?